Today’s bite further illustrates why multimessengers are so very important and exciting. It is not entirely clear what happened after the merger, and complementary information from different channels can help construct an accurate picture. The optical signal or ‘’messenger’’, for example, may carry slightly different information about the source than the radio waves do. So, if we manage to detect both, we end up with an additional clue about whatever produced them! Here, we will discuss the X-ray observations of GW170817/GRB 170817A. Today’s paper presents Chandra observations at 109.2 days post-burst, immediately after the Sun constraints were lifted. The X-ray flux of GRB 170817A has brightened significantly, with a count rate ~4 times larger than the previous detection at 15.6 days. Figure 1 shows the X-ray image at 109.2 days post-burst, alongside the one at 15.6 days post-burst, clearly showing the source get brighter. The spectra can be found in Figure 2 in the paper. Figure 1: Chandra X-ray image of GRB 170817A at 15.6 days post-burst (left), compared with the image at 109.2 days post-burst (middle), along with the difference image (right). The host galaxy NGC 4993 and two other sources in the field can also be seen. Figure 1 in the paper. In this model, an observable jet that breaks out is not required or favored. An outflow that injects energy into the shock continuously can produce a slow, monotonic rise of the afterglow emission. The outflow can either be a cocoon of material shocked by the jet, or a high velocity tail of the dynamical ejecta from the merger. Figure 2: Chandra X-ray light curve of GRB 170817A (black points), along with predicted X-ray light curves. The gray region is the period over which observations were not possible because of Sun constraints. Figure 4 in the paper. 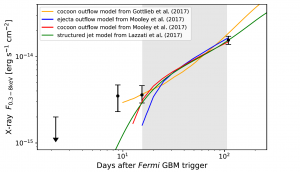 Figure 2 shows the Chandra X-ray light curve of GRB 170817A, along with predictions from structured jet, cocoon and ejecta outflow models. Note that the early time X-ray flux is underpredicted. However, these models were fitted to the radio light curve, which does not cover early times. A complete fit would need to include the X-ray data as well.